Warning: In case you are a professional or even hobbyist leatherworker you should close this browser window and slowly back away from the screen, as you will find some of my techniques and tools rather unconventional, if not downright blasphemous. You’ve been warned! 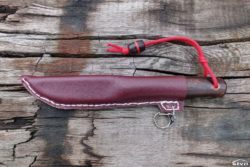 For the rest of us who consider that the goal absolves the means, here’s the story: recently I made myself a bushcraft knife by putting a wooden handle on a Mora Basic 546 blade (article coming soon), as I was extremely happy with the outcome I couldn’t wait to carry it on my trips but it didn’t have a sheath because the original plastic one didn’t fit any longer. I reached out to professional leatherworkers, but the cost of shipping the knife there, plus the sheath, plus shipping the knife and sheath back to me was more than I could afford, especially for an 8 dollar knife. 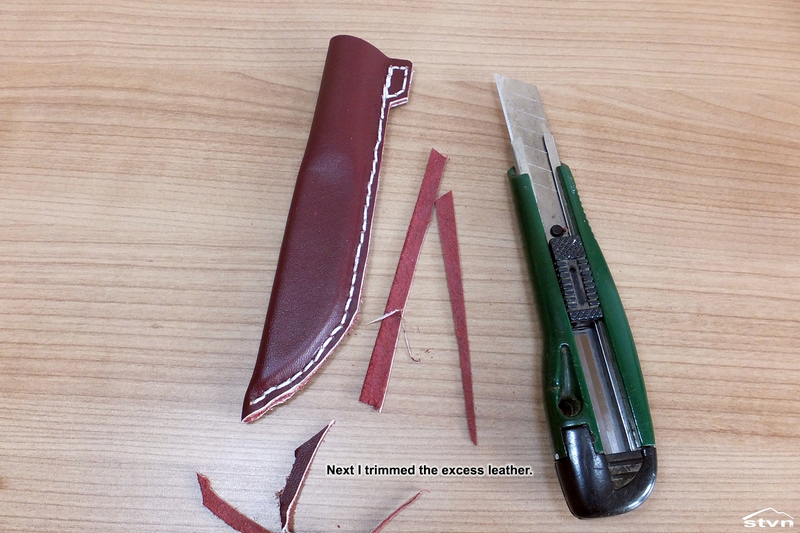 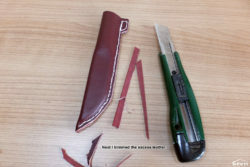 The next option was to buy leatherworking tools, from China of course, and try my luck at making the sheath myself. So I ordered 20 bucks worth of tools and all went good until the package “got lost” even before I got a valid tracking number and the seller probably lost his English dictionary because he doesn’t understand what I’m saying ever since. 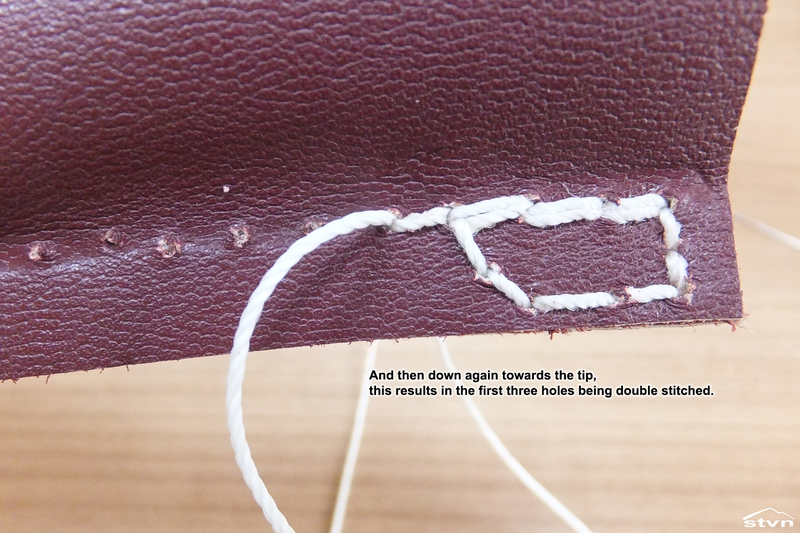 Hopefully I’ll be refunded in 60 days. Lack of tools and/or skills never stopped me from accomplishing my goals (and failures, as well as some work accidents either) so I decided that I’m going to make that sheath even if I’m forced to use only my teeth and nails. I wasn’t forced to use them, but I used a dinner fork along the way, I’m not kidding. 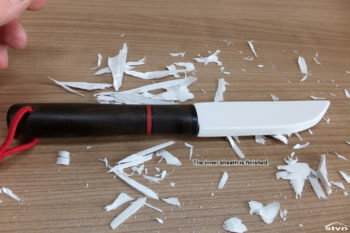 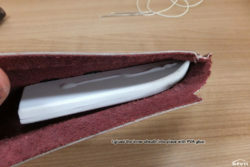 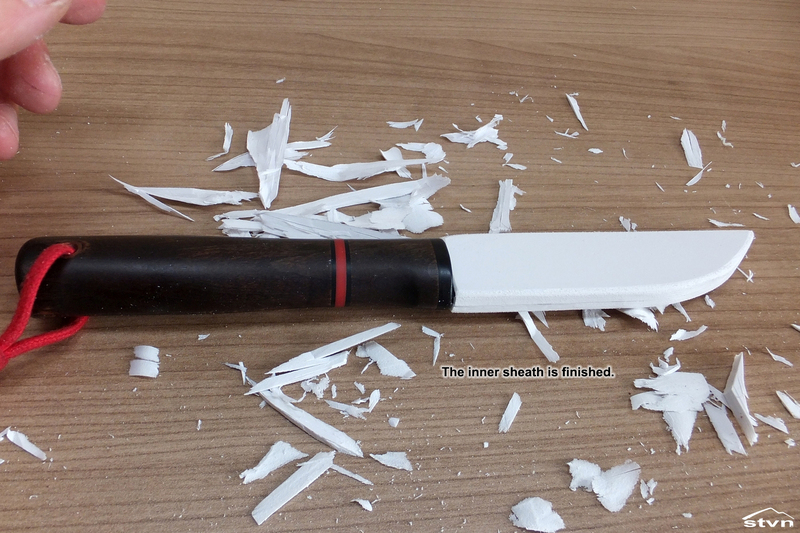 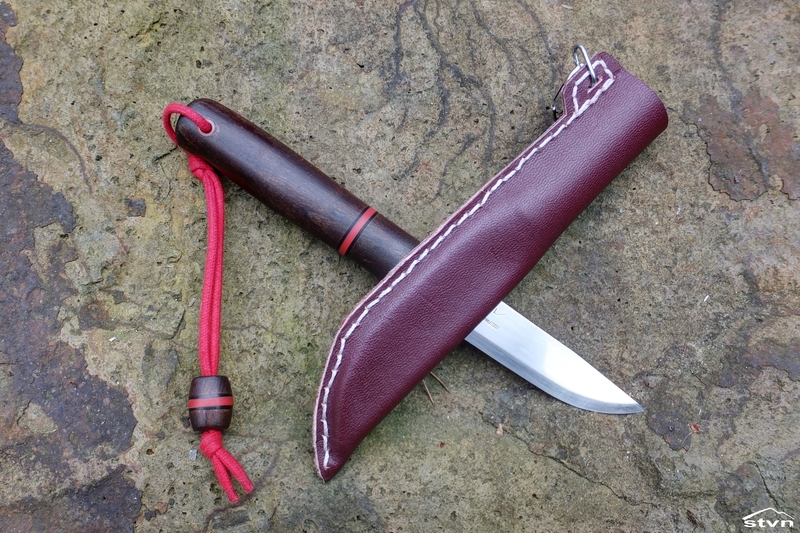 The sole purpose of this piece is to protect the stitching as you draw and sheath the knife, it is traditionally made out of (birch) wood, as far as I know, but I made it out of 4mm thick PVC foam board. PVC foam board (or sheet) can be found under different brand names and it’s mostly used in the advertising business, it is lightweight, carves and sands easily, and it doesn’t have a grain line which, in this case, is a huge advantage over wood as it doesn’t split, it rather bends. 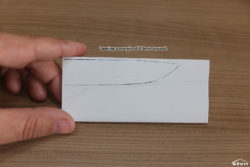 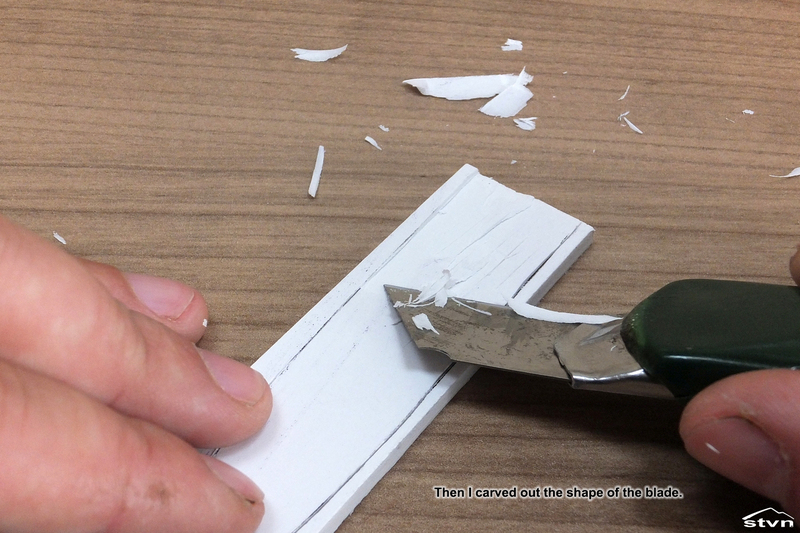 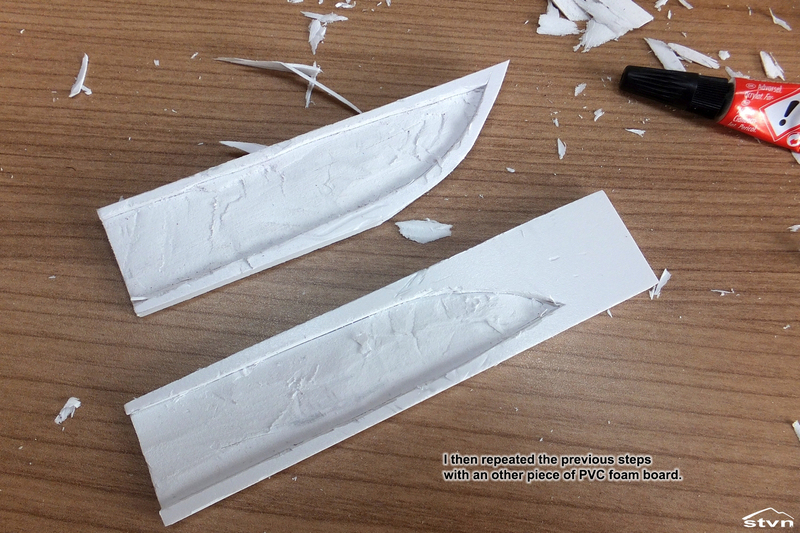 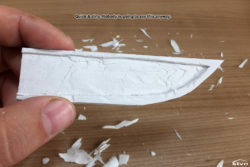 I started by cutting two sheets of PVC foam board slightly wider (5-6mm) and longer than the blade of the knife, then I traced the outline of the blade, with a pen, onto one of the pieces. 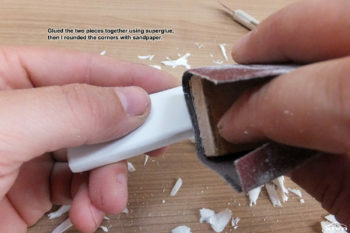 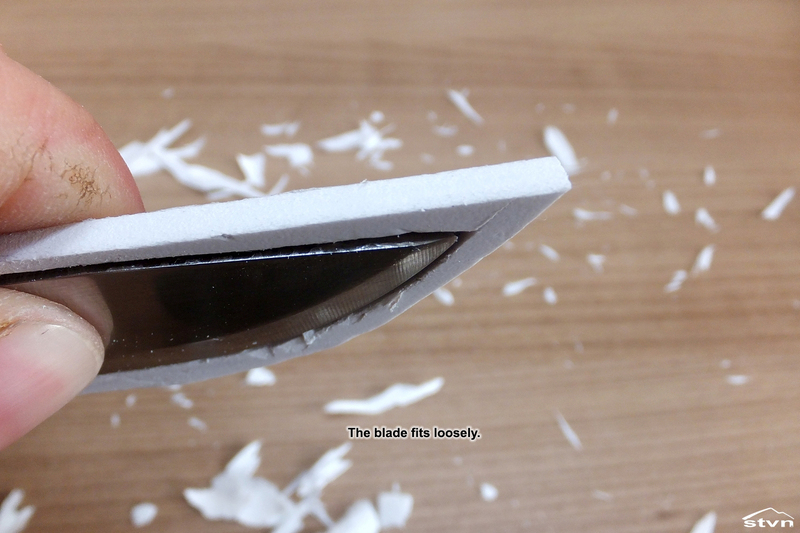 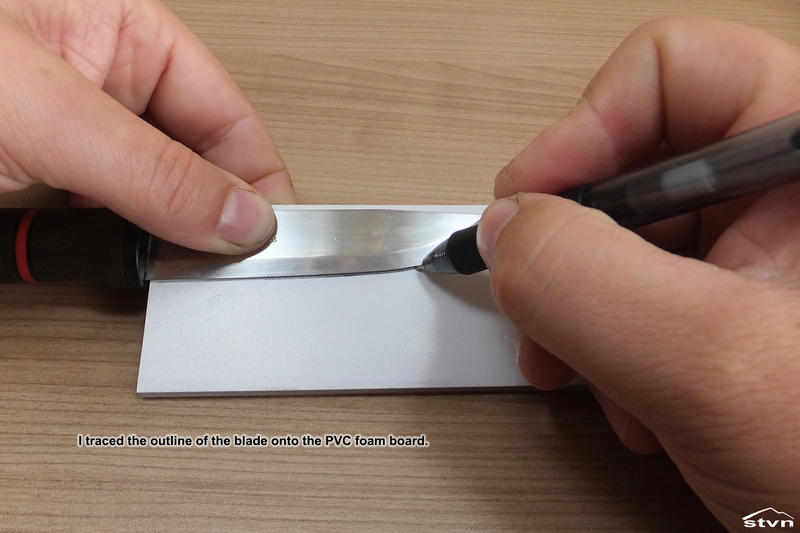 Next I used the utility knife to carve out the shape of the blade at a minimal depth of 1mm as the blade is 2mm thick. After I repeated the above steps with the other piece of board, I glued the two pieces together using superglue and rounded the edges a bit with 220 grit sandpaper. I used a piece of chrome tanned leather approx. 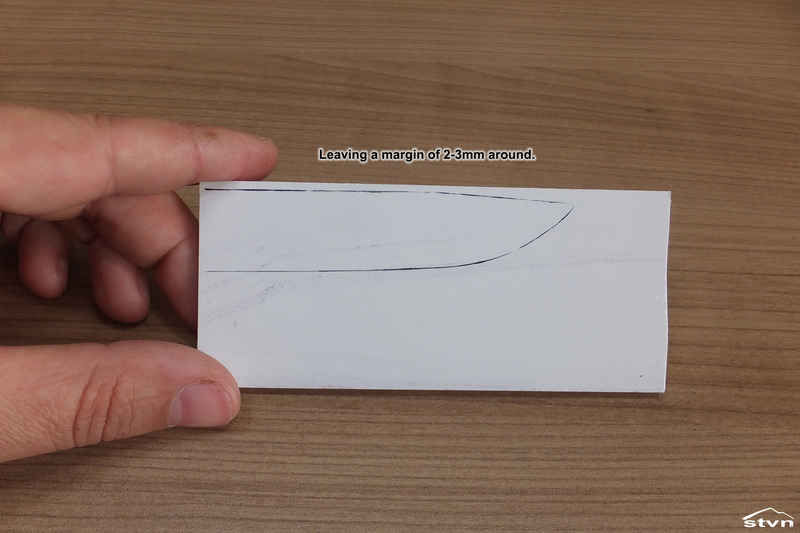 2mm thick that I had laying around for years. 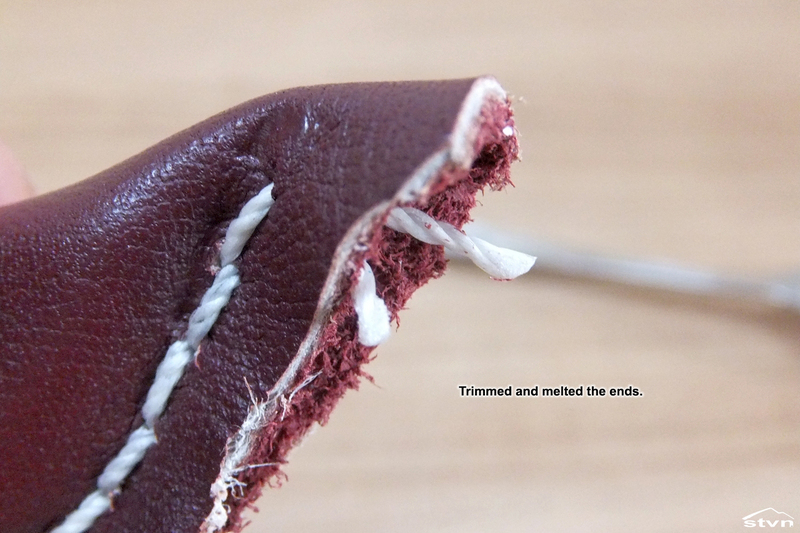 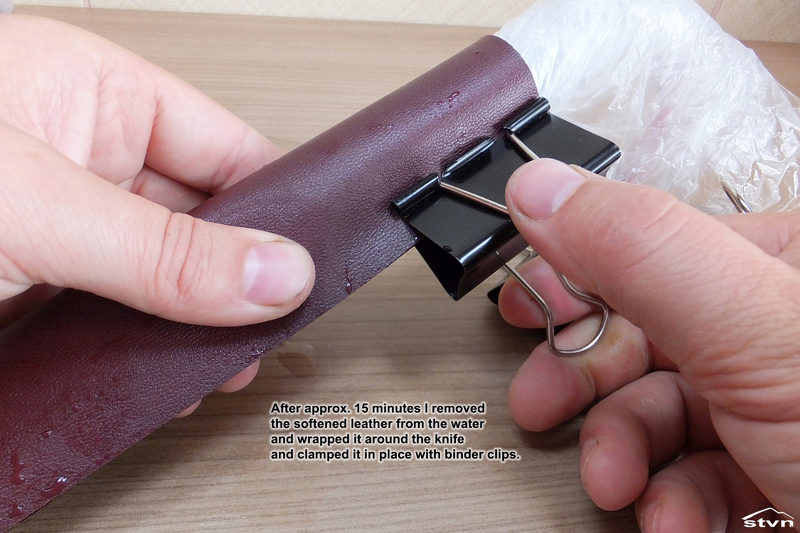 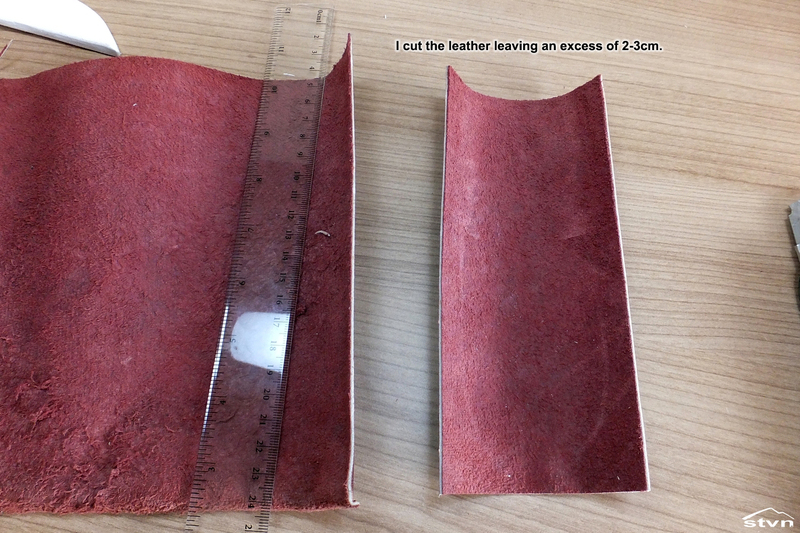 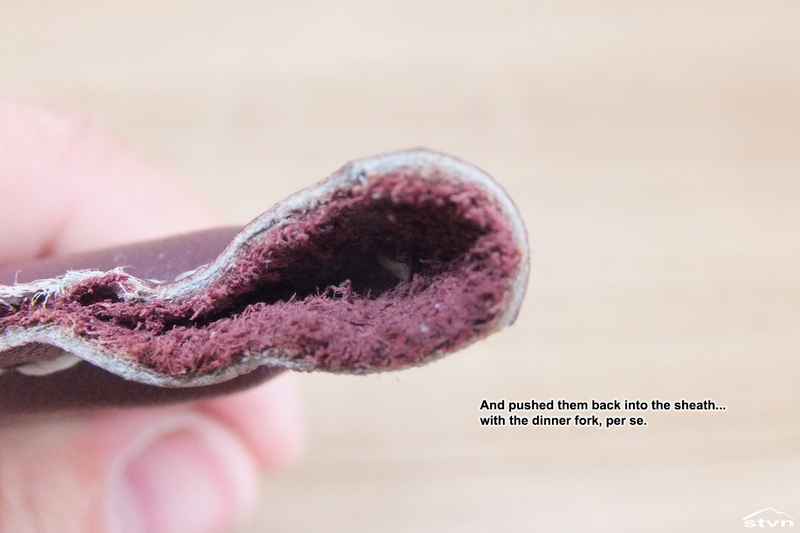 The first step was to wrap the leather around the knife and mark it, leaving a generous amount of excess (1-1.5cm) on both sides, then I cut it using a ruler and an utility knife. 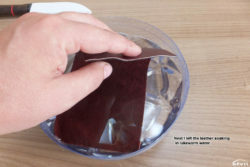 Next I soaked the piece of leather I just cut in lukewarm water to soften it, while the leather was soaking (15-20 min.) 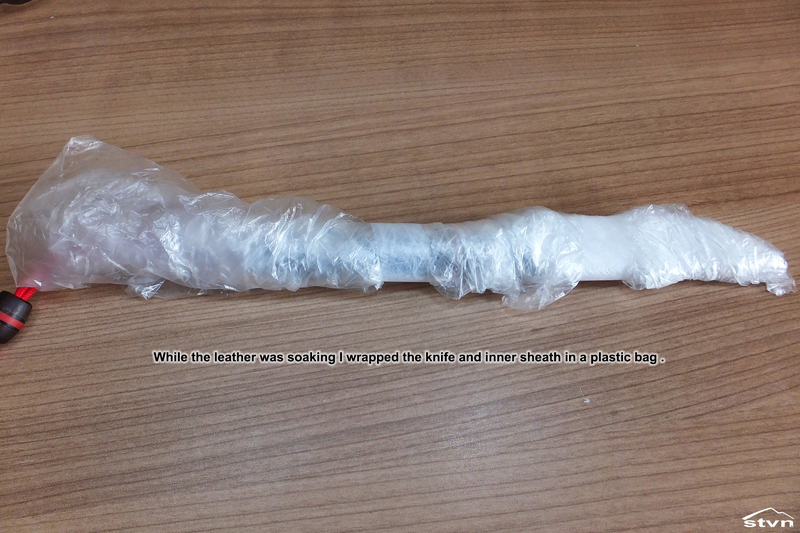 I wrapped the knife and inner sheath in a plastic bag to protect it from moisture. 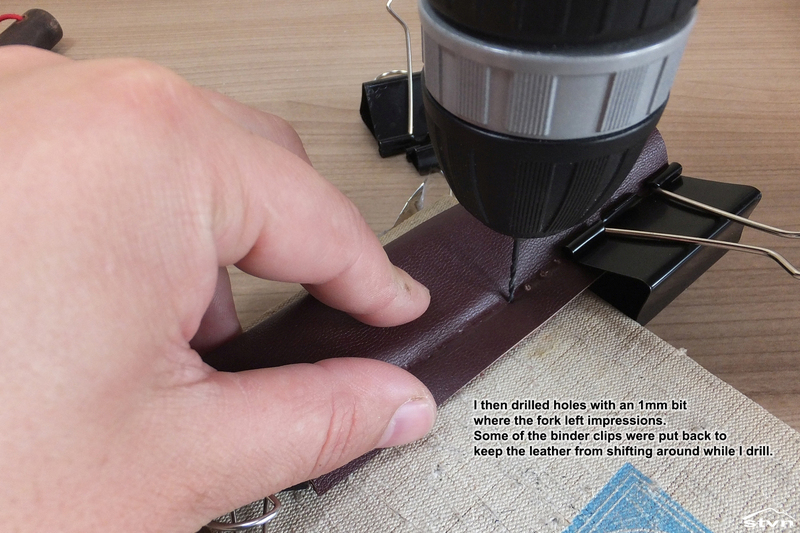 Once the leather softened I wrapped it around the knife again and clamped it with binder clips whilst stretching it as much as I could. 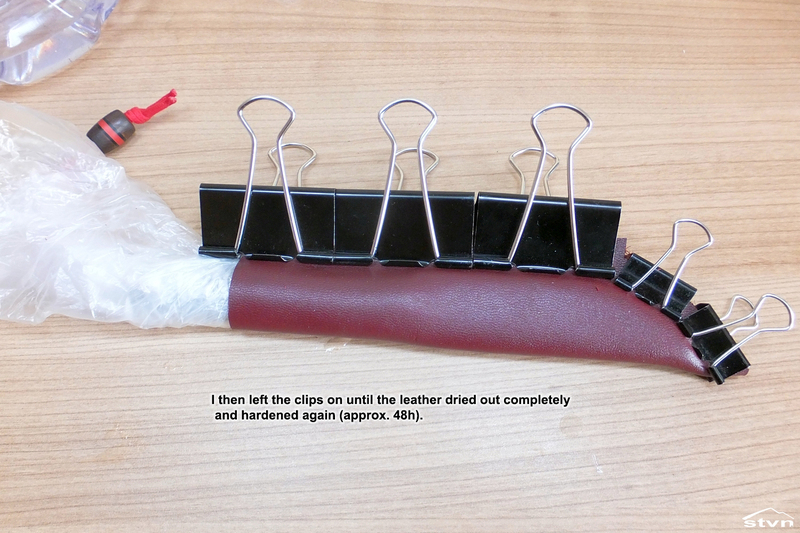 I left the clips on until the leather dried out completely, approx. 48 hours. 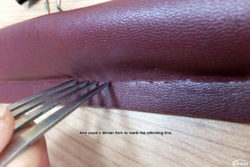 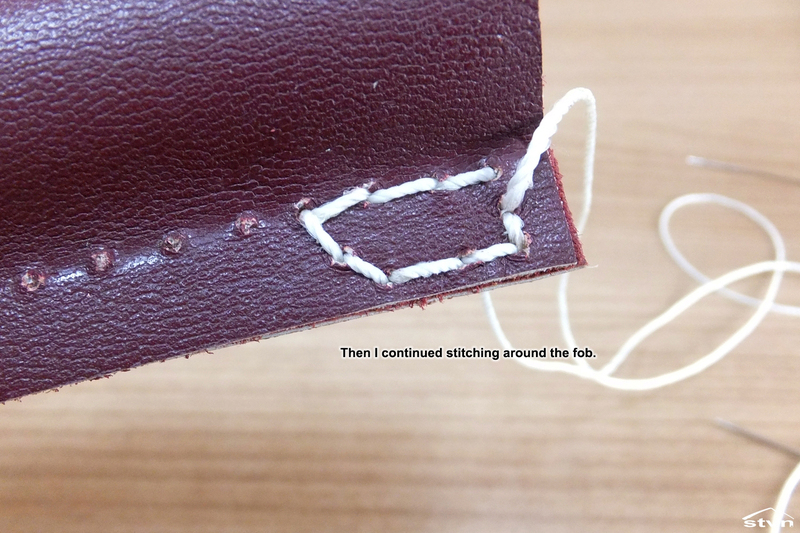 After the leather dried out and hardened I took a dinner fork (I told you) and used the prongs to leave impressions along the stitching line, then I drilled out each impression with an 1mm drill bit. 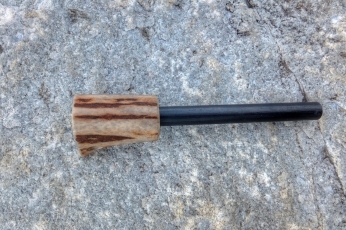 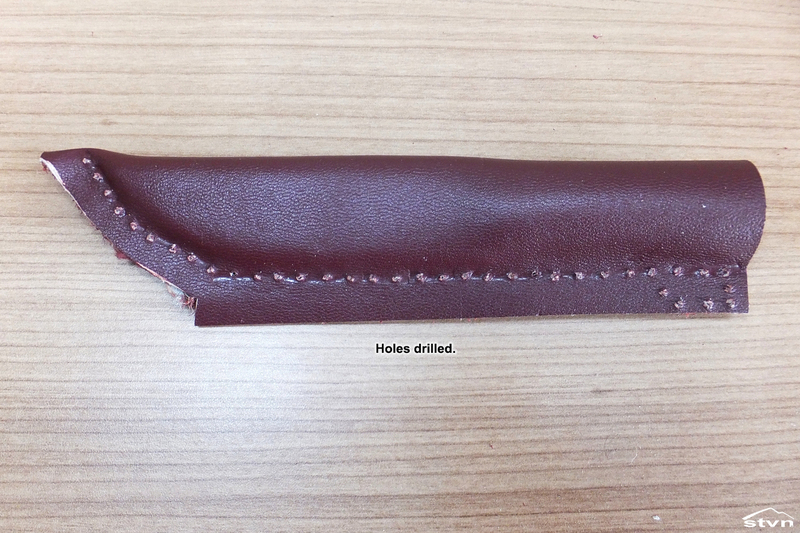 With the help of the dinner fork I managed to drill the holes at equal distance from each other, which really improves the overall look of the sheath at the end. 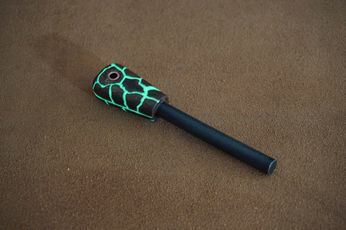 Holes drilled, I then glued the PVC foam inner sheath into place using a dab of PVA glue. 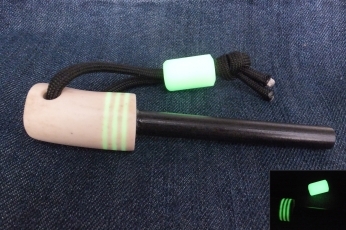 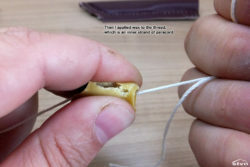 Next step is to prepare the thread: I didn’t have waxed thread, or any sort of stitching thread for that matter, so I pulled out an inner strand of paracord and waxed it with beeswax. 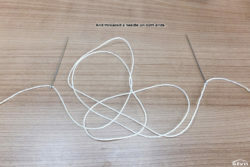 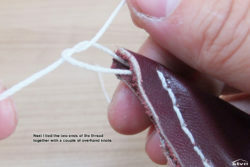 The length of the thread should be at least three times as that of the stitch line, but I used four to be on the safe side. 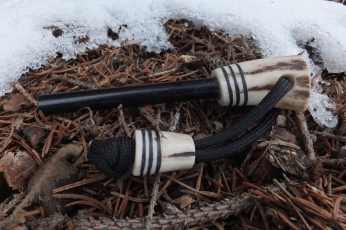 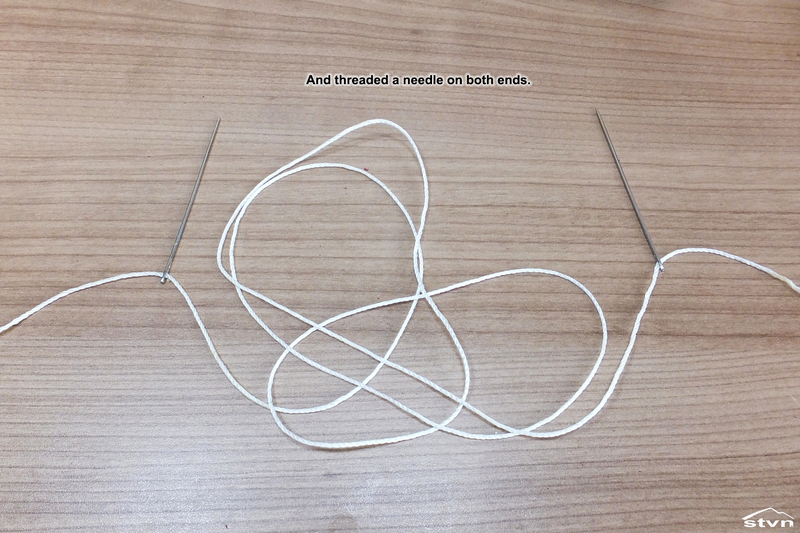 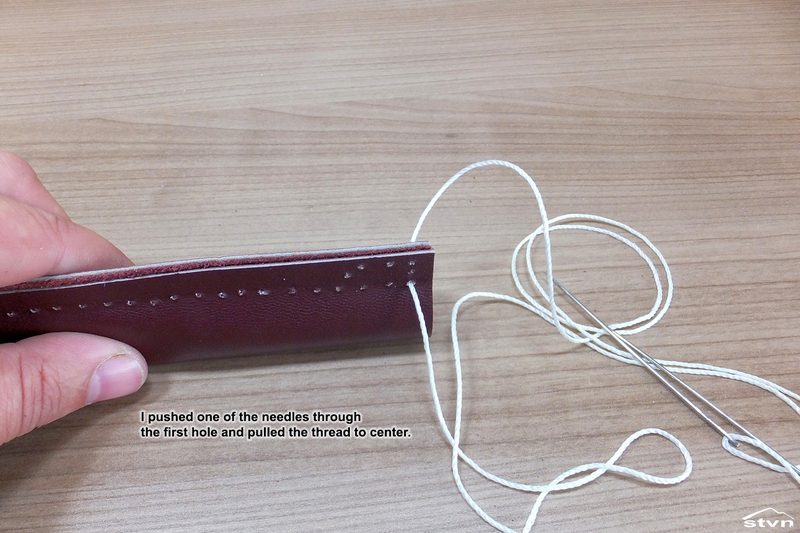 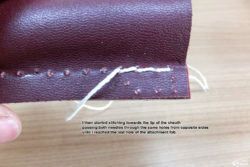 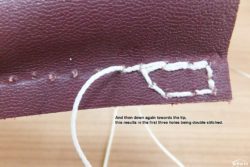 I then threaded the needles on both ends of the thread and stitched the sheath using the two needles technique (see photos above for details). 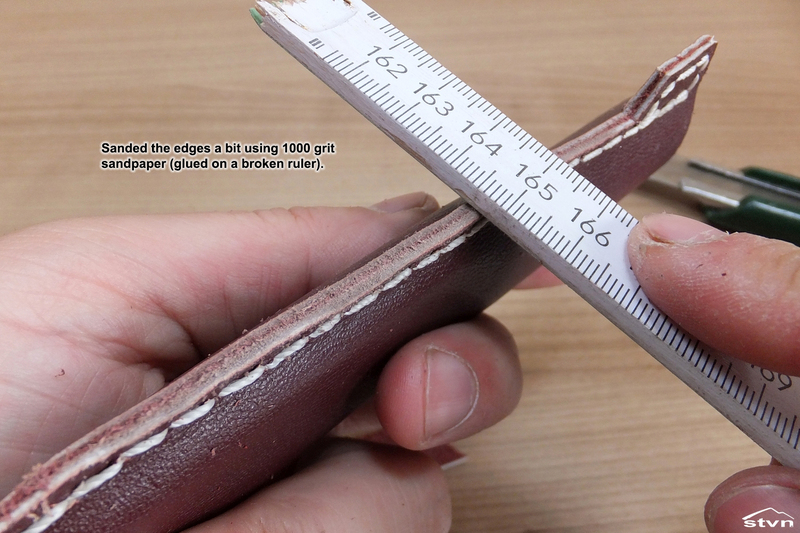 The last step was to trim the excess leather, sand down the edges a bit with 1000 grit sandpaper (glued to a broken ruler) and add a snap hook so it can easily be attached to a belt clip or lanyard. 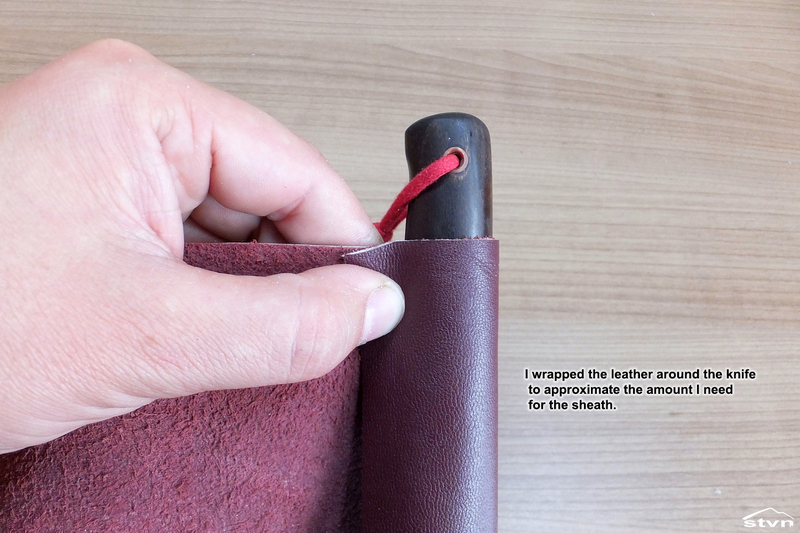 That’s it, it took me less than 3 hours to complete this project (not counting the time that the leather was drying) with no specialist tools and no leatherworking experience whatsoever, so, I think I’m going to reorder those tools from China after all… more (and hopefully proper) leatherworking projects coming soon. 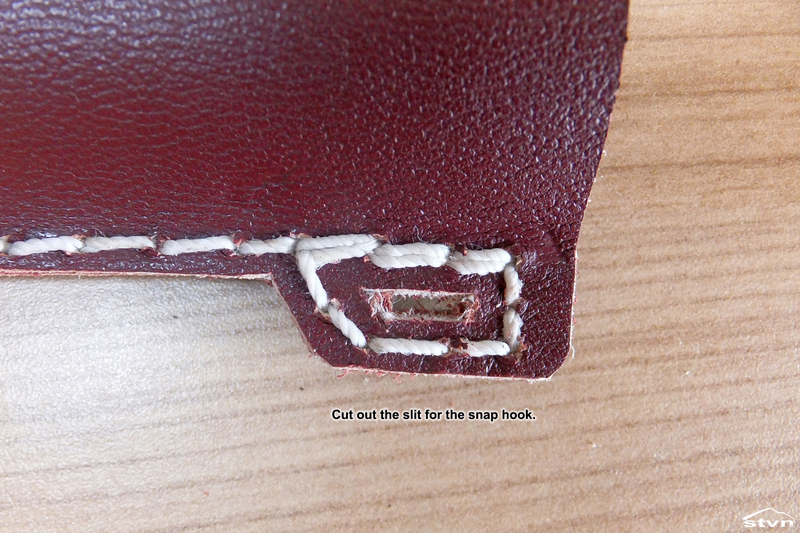 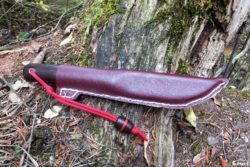 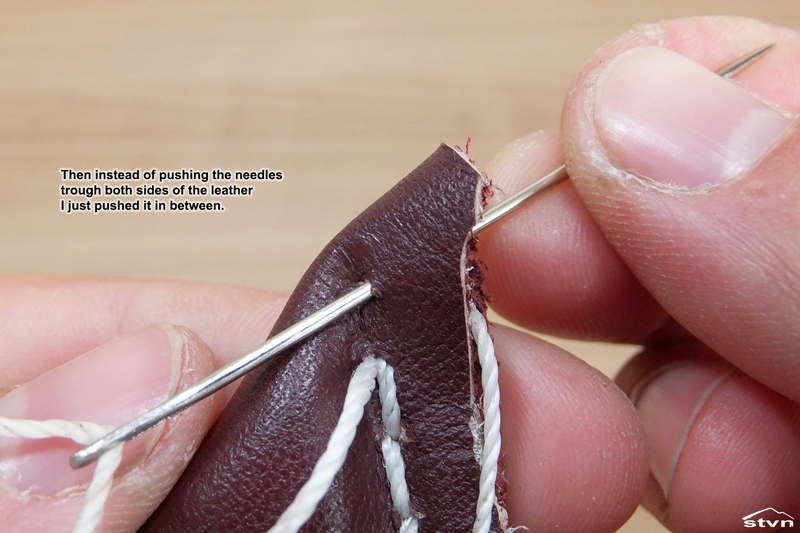 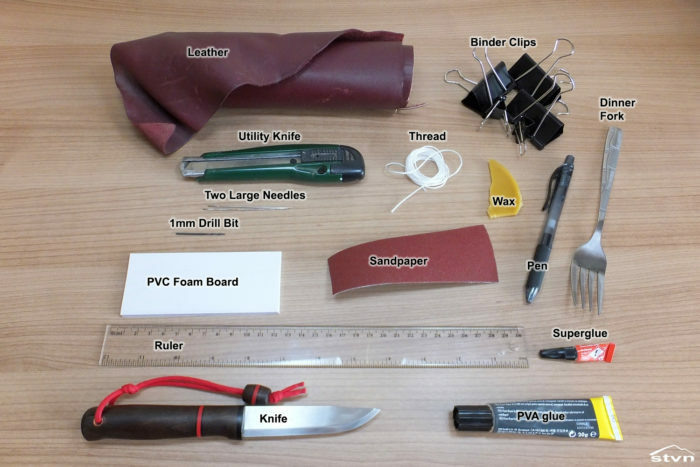 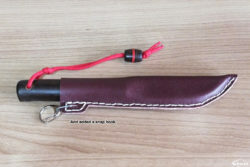 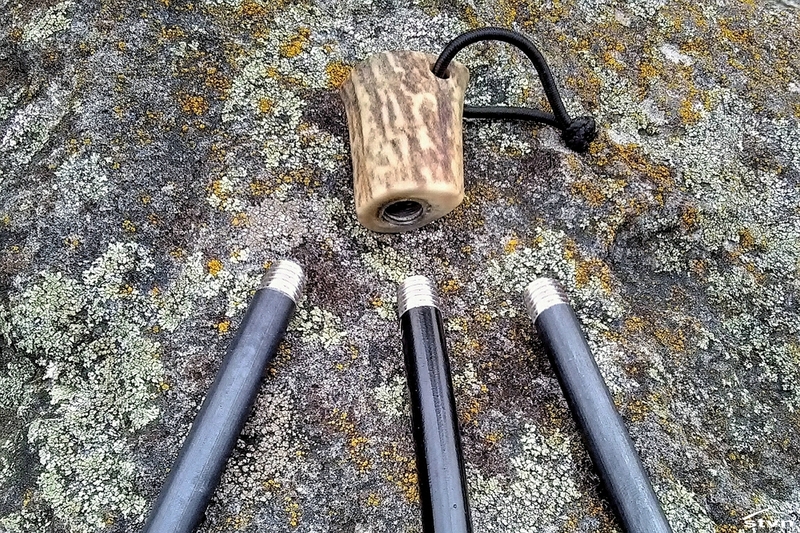 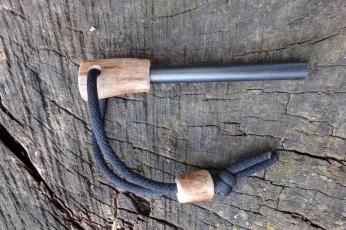 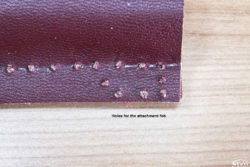 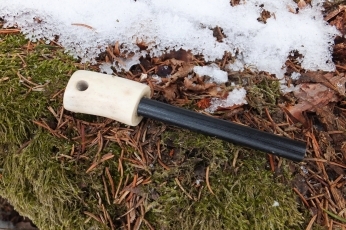 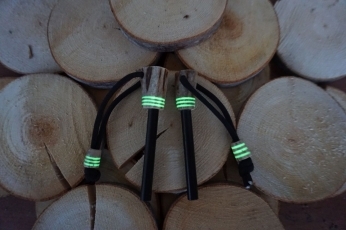 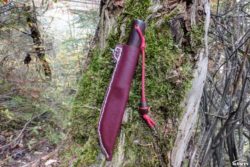 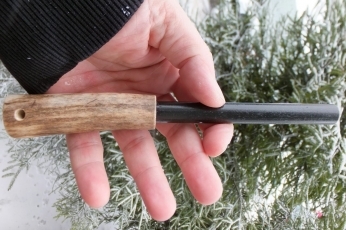 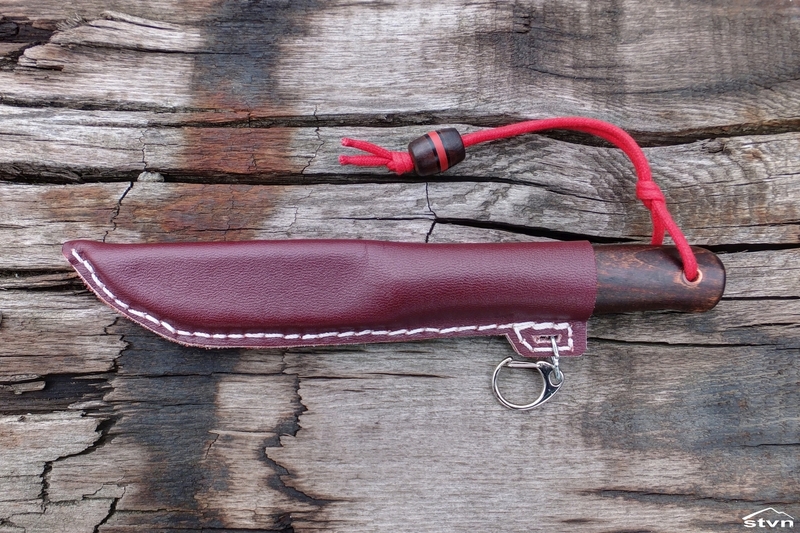 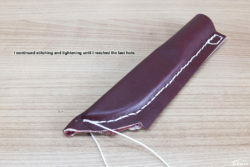 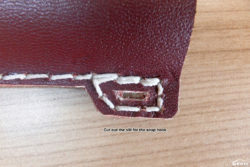 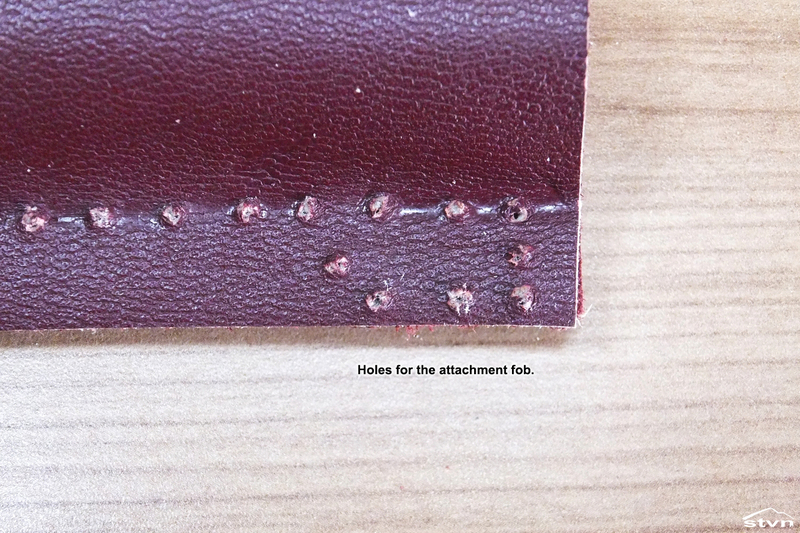 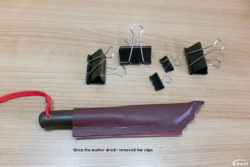 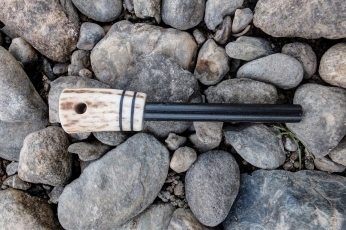 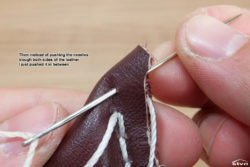 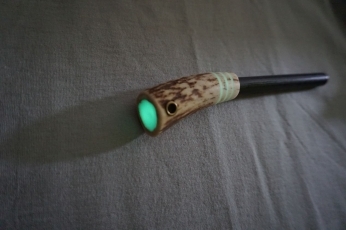 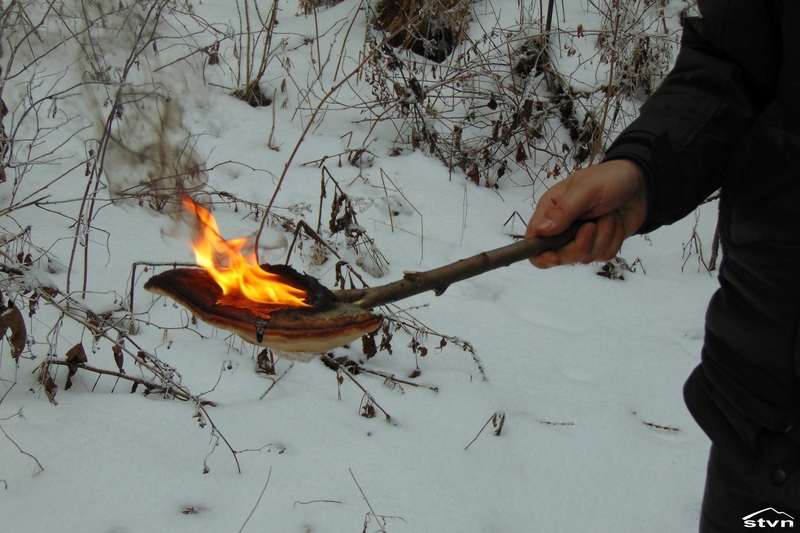 You may copy this article as long as you link back to this page (https://stvn.eu/making-puukko-sheath-no-leatherworking-tools-skills/) or the frontpage (https://stvn.eu).